Though various leaders have tried implementing socialist and communist economic policies since they were first established by Karl Marx in the 1800s and refined by Vladimir Lenin in the early 20th century, they have never worked. The Soviet Union was perhaps the biggest experiment in communism that failed: Though it took more than 80 years, the fate of the U.S.S.R. was written well before the country collapsed, broke and broken, in 1991. Venezuela appears to be the next domino to fall in the long line of failed socialist states, and its collapse will be as profound – but likely much more violent – than that of the USSR. Venezuela is not the first developed country to put itself on track to fall into a catastrophic economic crisis. But it is in the relatively unusual situation of having done so while in possession of enormous oil assets. There aren’t many precedents to help understand how this could have happened and what is likely to happen next. Prior to the election of Chavez, and then Maduro (yes, they were both elected), Venezuela was what you might call the jewel of South America. It was the continent’s wealthiest country. But state management of the economy, which included price controls, redistribution of assets and other measures that killed competition and profits have led to massive shortages in basic items – food, clothing, medicine, even plastic to laminate new passports. The government has placed controls on foreign exchange rates and prices of basic goods, which has created shortages and widespread corruption. 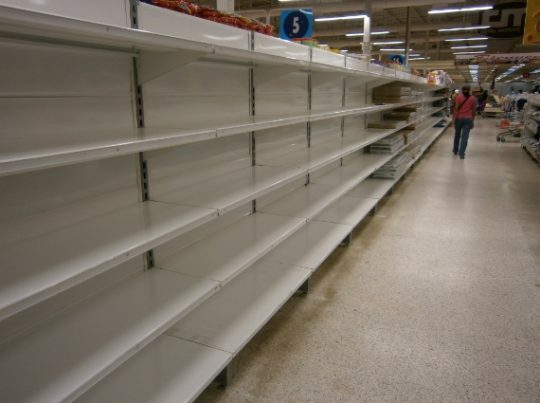 Public spending has been unrestrained and nearly all private industry has been taken over by the Maduro government. The state-owned oil company, PDVSA, has been plundered. A 100-bolivar bank note, the country’s largest, is now worth about three cents, inflation being so bad that the country’s currency is now worthless (800 percent this month). “As desperation rises, so does the intransigence of Venezuela’s ‘Bolivarian’ regime, whose policies have ruined the economy and sabotaged democracy,” the Star Tribune notes. Maduro’s approval rating is at 24 percent. He must now resort to arming some 400,000 special “militia” loyal to him alone in order to remain in power (private firearms ownership has been banned, by the way). The pattern of socialism and communism is always the same: Economic decline, loss of freedom, rising authoritarianism, violence, collapse. Some countries adapt and recover (see China) ; most don’t (see Cuba). It can happen to any country, at any time – even beacons of liberty like the United States. All it takes is electing the wrong person who believes in a failed political ideology. Read more stories about the consequences of bad government policies at Collapse.news.